Cornell researchers find 'wild bees' to be better pollinators and more plentiful. Fruit and vegetable growers in the Northeast aren't quite as frantic today as they were when colony collapse disorder began decimating honeybee populations. That's because wild or native bees are now getting their fair share of buzz. They are two to three times better pollinators than honeybees, are more plentiful than previously thought and not as prone to CCD, says Cornell University entomology professor Bryan Danforth. That's particularly good news for apple growers. He and other Northeast researchers are involved in a five-year, $3.3 million project to study whether the pathogens, viruses and fungi that are harming the honeybee also affect native bee species. The grant, led by Anne Averill of the University of Massachusetts-Amherst, will also investigate how native bee abundance and diversity are influenced by the size, pesticide use, landscape and crop diversity on farms. 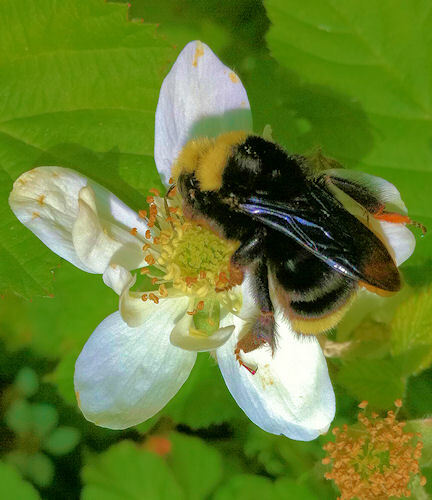 Danforth is also the lead researcher on a four-year, $450,000 grant from the U.S. Department of Agriculture's Agriculture and Food Research Initiative that will fund research on native bee species abundance in New York state apple orchards. "An individual visit by a native bee is actually worth far more than an individual visit by a honeybee," he contends. "Honeybees are more interested in the nectar," explains Danforth. "They don't really want the pollen if they can avoid it. Wild, native bees are mostly pollen collectors. They are collecting the pollen to take back to their nests." They're also more plentiful than once thought. In 25 surveyed orchards near Ithaca and Lake Ontario, Danforth and his team expected to find 40 to 50 native bee species. They found almost 100. However, the importance of honeybees to food producers is not diminished. Unlike most native species, they can be moved from farm to farm. For example, honeybees are critical in pollinating California almond fields in February when there are no native bees around, Danforth says. New York State, alone, has roughly 450 native bee species, which Danforth says, can help pick up the slack of the declining honeybee. Native bees may have been doing a lot of pollinating work all along, but not getting credit for it, he adds. "In the past, the attitude has always been, 'Well, you have the crop, and you have the honeybee, and that's all you really need.' But nobody has ever bothered to ask, well what about all these other bees that are out there?" Danforth says. "The role of native bees in crop pollination has been largely unappreciated – until colony collapse disorder created a crisis." August's American Agriculturist reported the good news buzz about native bees. For the page 13 story on creating native bee habitat, click on: magissues.farmprogress.com/AMA/AM08Aug11/ama013.pdf.